Had a fun 300 point game against a newer player who started with vanilla PanO. In the short time he’s been involved in Infinity, he’s painted more models to completion that I have in my entire multi-year Infinity career, and to a higher standard to boot! This game was won and lost in deployment, as is often the case with newer players. To his credit, my opponent stuck with it, problem solving his way through some tough situations I presented him with, and even clawed back some wiggle room for his beleaguered forces. My opponent (and others) asked for me to go a little deeper into my decision making process as well as my thoughts on the my opponent’s play in this writeup, so I’ll try to do that. 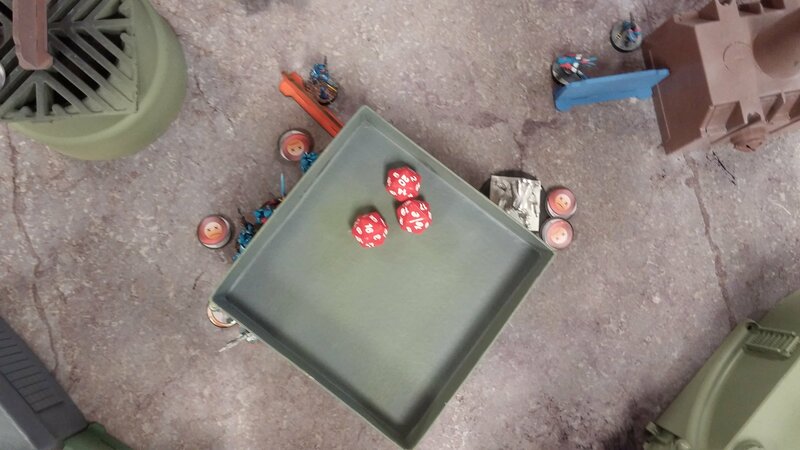 Another change to the usual was that I tried out rolling dice with a cup, a technique I learned from a most classy gentleman I met at the June Doom tournament. I’m a huge fan. It completely avoids the problem of rolling dice on the tabletop and having them move terrain, knock models over, fall off the table, etc. Sure, you can roll on the tops of buildings, which I often do, but I like this better. It also adds some proper roll to the dice. I’ve definitely tossed a die onto the table but had it slide instead of roll before, which feels pretty cheaty even if it’s just a weird physics interaction. I figure the Spektr can be used in a similar fashion to a Hellcat BSG, i.e. as a spot remover. The MSR will give me the potential of causing up to 4 ARM rolls, and TO gives me potentially -12s to my opponent, depending on range bands. I think the Spektr is less risky than the Hellcat, and effectively has one more order. Fortunately, I don’t have to choose between them and I just take one of each. 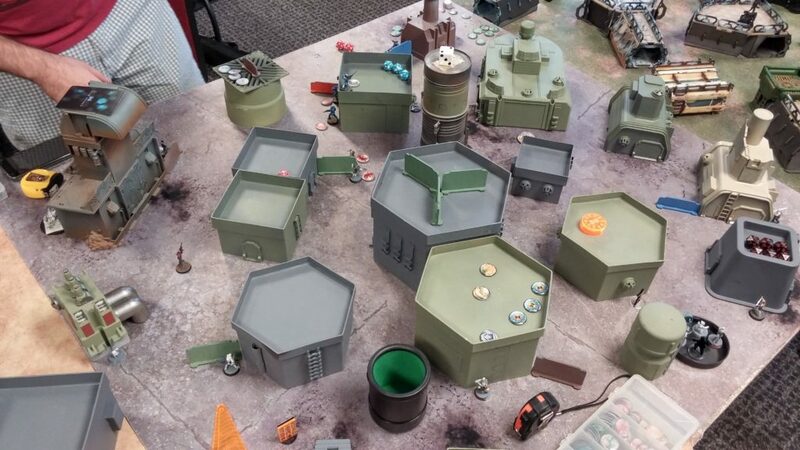 Of course, I forgot to take pictures of deployment again, but here’s a picture from PanO Turn 1. I put the Mobile Brigada Missile Launcher and Daktari on the left, as I have the Experimental Drug classified objective, and I figure I have the best chance of doing that on the Mobile Brigada. Turns out to be an illegal play, trying to go from 1 wound back to 2, but oh well. I speedbump the approach to the Mobile Brigada with a Moran and his Crazy Koalas. Acid Burn (Zero KHD) and Zero Cool (Interventor HD+) are on the right, as far up as I can put them. Lupe, the Jaguars, and the rest of my forces are strung out in cover in my backfield, watching for AD troops. I leave my Lt a little exposed in the backfield, figuring I can ARO against any AD troop that falls out of the sky without worrying about LoF arcs for him. I hold the Spektr MSR in reserve, and it’s my opponent’s turn to deploy. ORC HMG / Pistol, Knife. He holds the Nisse in reserve. I decide I want to try throwing the Spektr over the centerline, perhaps on the sniper tower on the left near the Bulleteer spitfire, but I flub the roll and the Spektr just cheerleads watching a firelane that goes mostly unused the whole game. I have to put him in contact with a table edge, so he covers against AD troops, and I put him near my Intruder to cover all my range bands. I choose the same firelane as the Moira HMG to get some defense in depth in case something makes it through her. The Spektr can’t see the building where everything is due to the angles, but I decide this is probably ok. Finally, the Nisse comes out of reserve prone on the building that most of the PanO troops are hanging out next to. My goals for this turn are to put some hurt on the bunched up models and attack his order pool. The ORC HMG really needs to go away, as that’s probably the scariest thing he’s got on the field, followed by the Spitfire Bulleteer. I trust in my Crazy Koalas and the Moran’s repeater to stop the Bulleteer, which is probably a safe bet. I deployed the Crazy Koalas far enough from one another to force him to dodge on two separate orders, increasing the likelihood that I’ll hack him successfully or drop him with Koalas. This of course is just a lucky happenstance of his response to my deployment and not any actual action on my part. I do what I have to do and spend the Morlock’s impetuous order to move-move her up the field, with no AROs. She rolled +3 PH and Regeneration on her Metachemistry roll. My next order is dropping in the BSG Hellcat to try to take out as much as I can. The most efficient way for me to do this is to take advantage of my opponent’s deployment and drop a shotgun template on his lined up troops. The question is, do I try to take out the Bulleteer, Hospitaller, Fusilier line, or the ORC HMG, Father Knight, Fusilier line? I think the math is better taking advantage of the bad rangebands of the ORC’s HMG as opposed to trying to out shotgun an ODD shotgun. I drop the Hellcat in behind the green barrier in total cover, and poke him out to start shotgunning stuff, i.e. the ORC. I can only get the Fusilier Paramedic under the shotgun template from this angle, but I want to stay in cover to put him at -6 total on that HMG. My first burst puts a wound on the ORC, but the Fusilier Paramedic dodges. My second burst, the ORC crits the Hellcat, so I bring in another tool to finish the job. 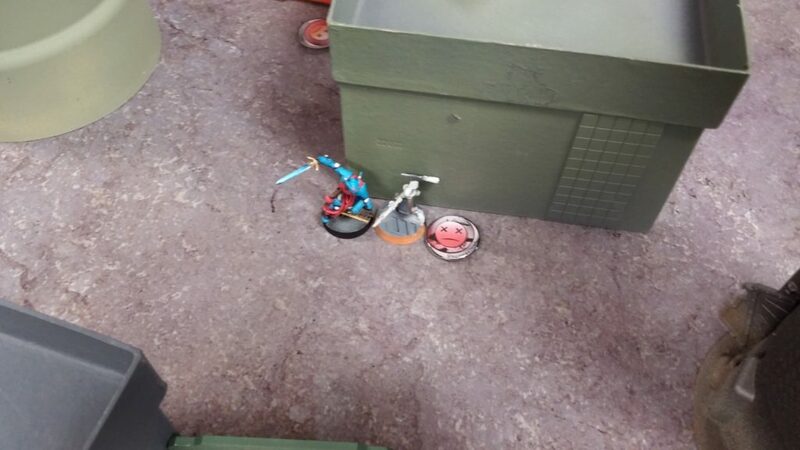 I spend the last of my orders in my second combat group up the field bring the Morlock up, snagging a pretty useless Flash Pulse from a Panoply on the way. With my last order in combat group 2, I chain rifle the ORC, the Father Knight, and the Fusilier Paramedic, putting a wound on the Father Knight and I think killing the Paramedic (or maybe a mine got him later, not sure). The ORC drops the Morlock with his HMG and keeps on trucking (sorry about the picture, it’s from later in the game). 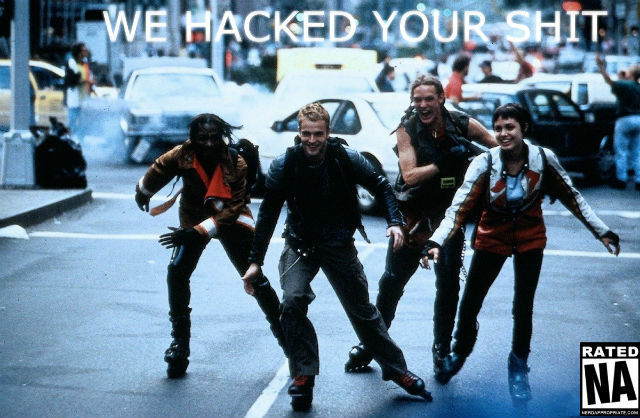 I dash Acid Burn, my Zero KHD, up the field and start hacking stuff. I idle next to the building, and he AROs with Brain Blast from his Fusilier Hacker and Carbonite from his Father Doctor AHD. Acid Burn declares Trinity, putting two dice at the Father Doctor and one at his Fusilier through the Bulleteer’s repeater. After a few orders of this, she manages to put the Father Doctor unconscious (BTS 9 is rude, hooray Interventors), but the Fusilier Hacker passes all of her BTS rolls. At some point during this, I move the Mobile Brigada to cover the Nisse’s position with her Missile Launcher, and push the Reverend Moira HMG into a better position, watching both corners of the building in case the ORC or Bulleteer decide to pop out. The way I see it, his priorities for this turn are to get rid of my Acid Burn because she’s in his grill and then start advancing his troops. To do that, he’s gotta take out my Moira HMG and probably my Mobile Brigada Missile Launcher. The Fusilier hacker attempts to kill Acid Burn, but fails, going down to the KHD Redrum program. Hackin’ that Gibson! This was a mistake, I think. He’s got tons of better tools for dealing with a KHD nearby, and doesn’t need to risk his hacker even in an active-turn FtF. Next, he spends a coordinated order on the Nisse, the Hospitaller, his Lt, and chooses the Bulleteer heavy shotgun as his spearhead, intending to try and shoot my Mobile Brigada with the Nisse and my Zero with the Bulleteer. We have a brief discussion about how coordinated orders work, and how you have to declare the same target for all your orders, so the Nisse stays prone. The movement isn’t wasted though, as the Nisse is now in cover against the Mobile Brigada for when he stands up. Later in the turn, this movement also allowed the Hospitaller to pick the Father Knight AHD back up as well. I declare dodge for Acid Burn versus his Bulleteer’s single coordinated order shot, and skitter away successfully. He moves up again, and Acid Burn skitters all the way around the corner. Acid Burn is rollin’ some hot dice–pretty sure she should’ve taken a wound there. It just goes to show that dodge is often a good idea in ARO. My Moira takes a shot at the Bulleteer as this happens, but its ODD protects it. On my end, I think dodging to force the Bulleteer to break total cover and expose itself to the Moira HMG if it wanted to keep shooting at Acid Burn was the right call. It was a long shot, but I’ll take any normal roll I can! I think the Bulleteer Heavy Shotgun was the right tool to remove my Zero here, as I don’t have many options to ARO. I can’t hack it, unlike the Fusilier Hacker, because KHDs are useless against non-hackers. It has ODD so I can’t really shoot it either, and putting down a mine gives it a normal roll to kill me. Using the ORC is also okay, but the HMG range bands are bad against my Zero, it already has a wound on it, and it doesn’t have ODD to protect it from my Moira HMG. I guess he could’ve split dice against my Zero and the Moira, but the shotgun feels like the right choice here. The other good option was to bring up the Auxilia’s Auxbot to flamethrower my Zero, which essentially forces me to dodge and only risks a 4 point Auxbot. I think trying to kill a KHD with just a regular HD carried by a line infantry was very risky. Infinity is a game of lateral thinking–don’t try to match a superior foe in his/her strength. Move laterally and find a weakness. KHDs are very good at killing hackers, but Zeros are very squishy and not all that great at shooting, so just come around the corner and murder me with a shotgun, which is what my opponent ended up doing. At this point, the Nisse stands up, and we have a brief discussion of how DA and AP ammo work. He elects to use AP ammo, since my Mobile Brigada is ARM7 in cover. He shoots, with my Brigada at ARM5, and puts a wound on her in our first exchange of fire. 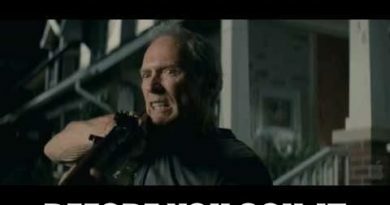 He spends another order, again choosing AP ammo, but I win the Face to Face and the EXP ammo does the rest. Mimetism + Cover in good range bands usually means two dice beat out one if you’re on the Mimetism side. The numbers are borne out by what happened in the game. The Nisse put a single wound on my Mobile Brigada on its first order, but the dice were on my side on the next order, when the Missile Launcher blew the Nisse off the table. Things get even better for MULTI Sniper Rifles if you choose DA mode, because then I have to make up to 4 ARM saves, and no one likes rolling ARM saves. 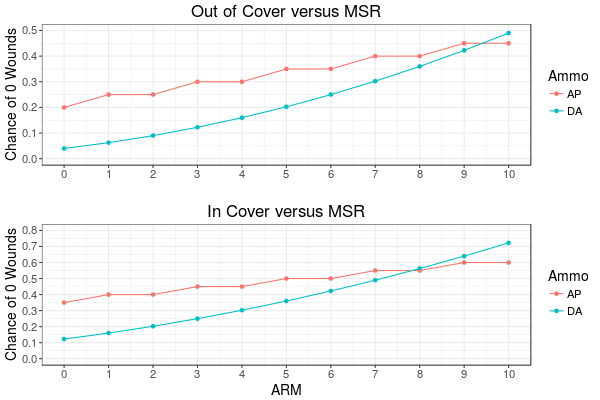 In any case, I think the big takeaway lesson is as follows: anything that forces multiple ARM or BTS saves per successful hit (like Missile Launchers) is really good in ARO. No matter how many dice you’re throwing at a missile launcher, if even a single missile makes it through, that’s 3 ARM saves, one of which will probably take you out. Heavy infantry with missile launchers are even more rude, because they will stick around after failing a single ARM roll to fire another missile back on your next order. The same logic applies to Panzerfausts, and to a lesser extent things with Fire or DA ammo, as the above chart shows. 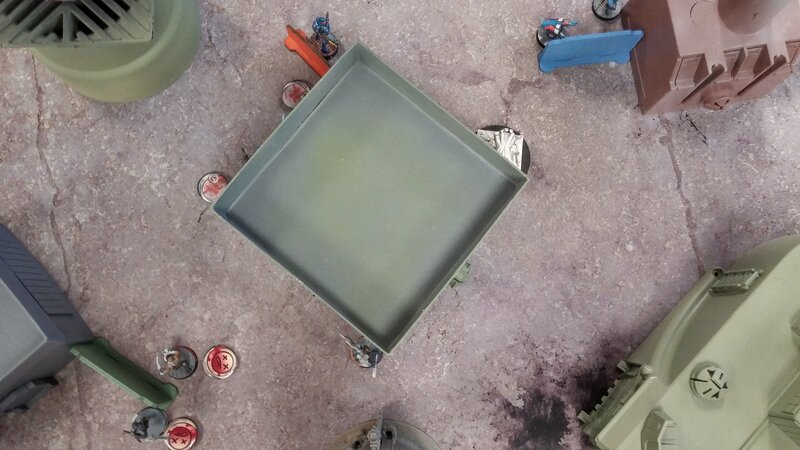 Any 40k Imperial Guard player will tell you to just throw buckets of dice at something until it goes away. Or, put down nothing but tanks on the table… but I digress. The Hospitaller Doctor manages to pick up the Father Knight AHD, and the turn passes back to me. The ORC has to die. I have two orders to spend on the Morlock, and if I manage to pick her up there are a lot of chain-rifle-able things right in front of her. I want to set the mine off on the ORC trooper, hitting the Father Knight and the Fusilier Lt as well, hopefully taking them out. It’s a teaching moment about mines, how effective they are, and how you can use them to force tough decisions. My opponent and I chat about his options, basically either 1) dodge or 2) shoot. He decides to shoot the Morlock, trusting in his guys’ armor and not wanting an active chain rifle in his face. I don’t think either option is particularly good, but my gut instinct would’ve been to dodge. Tough call, especially with me rolling Regeneration on a +3 PH Morlock. The ORC hits, but I fail my Regeneration roll anyway. The mine goes off, sending the ORC unconscious. Mission accomplished! The Fusilier Lt and Hospitaller make their dodges, and the unconscious Father Knight makes his ARM. So now we’ve got two unconscious HI. I shuffle some troops around in my backfield, the only interesting thing of which is moving Zero Cool the Interventor up, and lay my final mine in the same spot before moving a little away from the corner before passing the turn. PanO is pretty low on orders now, but he’s got a AD troop waiting in the wings! He drops a Akal with boarding shotgun right behind my Mobile Brigada. Unfortunately, the Akal deviates in front of my Brigada and within a Crazy Koala’s zone of control. He fails 3/4 of the resulting ARM rolls and dies. Zero Cool lives up to his name and actually crits the Hack Transport Aircraft roll, but the Akal failed his PH roll so it didn’t matter. My opponent activates the Auxilia on the left and tries to discover the mine, but fails. He activates the other Auxilia and sets up the Auxbot to prevent me from just running up with my Interventor. With his second to last order, he tanks the mine successfully on his Hospitaller Doctor and comes around the corner to slice Acid Burn into ribbons. Nuuuuuu! He runs back around the corner, trying to pick up the ORC but failing, killing it. The mine failed to take anything else out, but I think my Moira HMG puts a wound on the Hospitaller. Discovering the mine was definitely the right call. I’m not so sure on the trying to pick up the ORC. With only one order left and a Moira HMG watching you, there’s not a whole lot you can do. It probably was the right call, trying to set up for Turn 3 by getting another order up, this one with an HMG. Movement is so precious in this game, making moving backwards usually a waste but perhaps it wasn’t in this case. I basically spend this turn trying to contain him and finish out my classifieds. I activate Zero Cool the Interventor and move him up until I can see the Fusilier Lt, killing it. Interventors aren’t the best at shooting, but three dice is better than one! Zero Cool fastballs a Fast Panda at the building just in case the Auxbot wants to run amok, or an HI comes around that corner or something. I heal a wound on the Mobile Brigada for my classified, which is technically illegal now that I’m re-reading the Doctor skill (you have to be unconscious). One of my Jaguars secures his HVT, and I throw the Interventor, the Moira HMG, and Lupe into suppression before passing the turn. Lupe isn’t anywhere near anything, but I did it with a Coordinated Order so why not. We tally up PanO points on the table incorrectly (I think we forgot the Bulleteer Spitfire), and incorrectly decide he’s in retreat. He’s definitely in Loss of Lieutenant though. His frenzied Hospitaller runs around the corner and eats a hail of HMG fire from the Moira, going down. Zero Cool does l337 h4xx0r stuff to the Knight through the Fast Panda, but this is actually illegal as Hospitallers have Stealth from Martial Arts. It ends up not mattering because ODD HMGs in suppression are very effective. 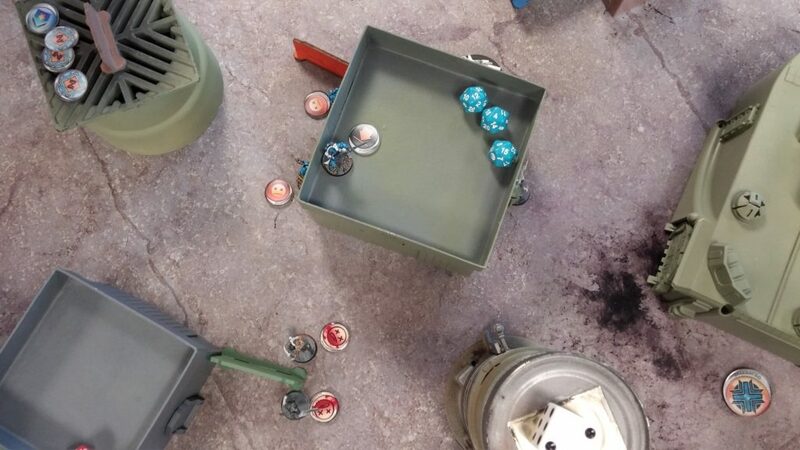 He moves the Bulleteer up to contest his HVT, but my last Crazy Koala takes it out. There’s not much he can do with his remaining irregular orders, so we call it and start tallying points. I accomplished all of the scenario objectives (kill more points, kill more lieutenants, open more panoplies) and secured the HVT, giving me 9 points. My opponent had successfully doctored an unconscious model, so he had 1 classified for a total of 1 point. My Mobile Brigada doctoring was illegal, which we didn’t catch at the time. As a result, I don’t get my second classified point. Gibson Hacked: 9-1 Nomad Victory! Thanks to my opponent for a good game! It was pretty one-sided as a result of some deployment issues, but his in-game decision making was solid, he stayed positive through the whole experience, and he clearly was taking mental notes and learning. I think that’s the victory condition for newer Infinity players: learning as much as you can with each game. In general, I think the decisions my opponent made throughout the game were good, it was just the deployment that was giving him trouble. It’s not so much that he set his units up in a line, it’s that he set them all up in the same place. This means I can bring all my forces to bear on one point, as opposed to having to spread myself thin to answer threats from multiple directions. Coordinated orders only get you so far. If I can see both sides of a building that most of your forces are behind with an HMG in suppression, you’re going to really struggle to leave that general area. If there’s a Missile Launcher, two hackers, mines, and an MSR lurking nearby it becomes nearly impossible. This is a common problem with link teams as well, especially in sparser table setups. 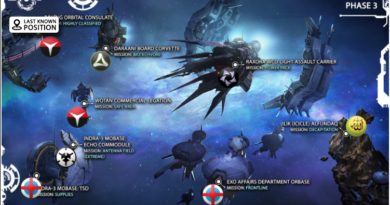 Also, not leaving anything out to ARO let me drop in a Hellcat, move up a Morlock, and move up Acid Burn, all unopposed. I often make this mistake, especially if I’m going second. You just have to weigh what you’re willing to let me kill versus the number of orders it’ll take for me to do so. The game probably would’ve gone much differently if the Bulleteer was getting free shotgun shots on Acid Burn as she was trying to hack stuff, for example. KHDs do what they advertise. AHDs are really only good against HI and TAGs. Math says use DA ammo over AP unless you’re dealing with ridiculously high ARM, in which case it’s a TAG. If it’s a TAG, don’t meet strength with strength, because it’s a TAG. Hack it, then use it to kill all their stuff. So basically, always use DA ammo. Watch out for HI’s with stealth, you can’t ARO hack them unless you have LoF. Securitate Hacker to the rescue? Naaah… maybe? You can only Doctor unconscious models! Whoops! Jury’s out on the Spektr MSR. I may still try this throwing him over the centerline thing in the future, but Bran is probably the way to go in the long run. I can get him to where I need with his mobility, and I have a BSG or Monkey King staff choose from as tools. If only he had grenades! Way too OP. I got a little sloppy with Acid Burn, my Zero KHD. I think that second mine placement was fine, but I totally forgot about the Auxilia on the left and should’ve set up to counter a discover on the mine. My own deployment was vulnerable to AD troops, I could’ve done a better job with my Jaguars. Had the Akal not deviated, I probably would’ve lost my Mobile Brigada and my Daktari. Being aggressive with Zero Cool the Interventor paid off. I’m liking taking him not as my Lieutenant. Fast Pandas continue to be totally worth 2 points, even if hacking through them this game was illegal. The extra 8″ is so useful. 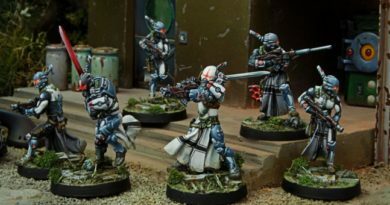 I think I need to make it a mantra when moving models: “check your arcs, check your arcs, check your arcs.” Maybe I’ll actually stop facing things directly at the enemies they can see, giving a free booty shot to Van Zant and other AD troops.